Reading and share top 84 famous quotes and sayings about United Nations by famous authors and people. Browse top 84 famous quotes and sayings about United Nations by most favorite authors. 2. "Nearly 60 years ago, the international community made a commitment to put an end to the crime of genocide by ratifying the United Nations Convention on the Prevention and Punishment of the Crime of Genocide." 3. "I cannot say that the attitude of the United Nations always is for the Israeli attitude. Israel, I think, has been under severe attacks by members of the United Nations many times." 4. 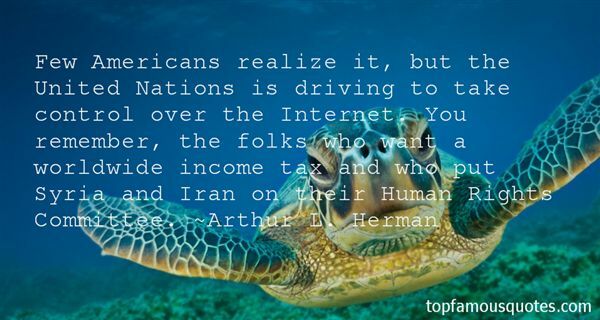 "Few Americans realize it, but the United Nations is driving to take control over the Internet. You remember, the folks who want a worldwide income tax and who put Syria and Iran on their Human Rights Committee." 5. "We begin with the common belief that Saddam Hussein is a tyrant and a threat to the peace and stability of the region. He has ignored the mandated of the United Nations and is building weapons of mass destruction and the means of delivering them." 6. "For me, the most ironic token of [the first human moon landing] is the plaque signed by President Richard M. Nixon that Apollo 11 took to the moon. It reads, ‘We came in peace for all Mankind.' As the United States was dropping seven and a half megatons of conventional explosives on small nations in Southeast Asia, we congratulated ourselves on our humanity. We would harm no one on a lifeless rock." 7. "The sublimated idealism of the Enlightenment, the spirit of the League of Nations and of the United Nations Charter have not proved strong enough to control the aggressive dynamism of nationalism." 8. "George Bush made a mistake when he referred to the Saddam Hussein regime as 'evil.' Every liberal and leftist knows how to titter at such black-and-white moral absolutism. What the president should have done, in the unlikely event that he wanted the support of America's peace-mongers, was to describe a confrontation with Saddam as the 'lesser evil.' This is a term the Left can appreciate. Indeed, 'lesser evil' is part of the essential tactical rhetoric of today's Left, and has been deployed to excuse or overlook the sins of liberal Democrats, from President Clinton's bombing of Sudan to Madeleine Albright's veto of an international rescue for Rwanda when she was U.S. ambassador to the United Nations. Among those longing for nuance, moral relativism—the willingness to use the term evil, when combined with a willingness to make accommodations with it—is the smart thing: so much more sophisticated than 'cowboy' language." 9. "Question: Which Mediterranean government shares all of Ronald Reagan's views on international terrorism, the present danger of Soviet advance, the hypocrisy of the United Nations, the unreliability of Europe, the perfidy of the Third World and the need for nuclear defense policy? Question: Which Mediterranean government is Ronald Reagan trying, with the help of George Shultz and Caspar Weinberger, to replace with a government led by a party which professes socialism and which contains extreme leftists?If you answered 'the government of Israel' to both of the above, you know more about political and international irony than the President does." 10. "Transferring our sovereignty and decisionmaking power to the WTO, to the United Nations, or any other international body is not in the long-term interests of our people." 11. "What the author of Genesis wants to tell us, I think, is that man, when united with God, is not divided. In this unity, there is no good and evil. All of our inclinations, even the sexual ones, are good when we are in Eden -- that is, when we walk with God and all our actions, words, and thoughts seek to follow His will. But man can choose to be separate from God, and in this separateness he creates evil by imagining ways to use what is good in ways that hurt him or others, and then acting upon what he imagines." 12. "Ever since taking office, the Obama administration has sought to accommodate Islamist demands that freedom of expression be curbed, lest it offend Muslims and stoke violence. For example, in 2009, the administration co-sponsored a United Nations Human Rights Council resolution along those lines." 13. "These are all good things, I said. But no one knows where your country is or who you are. You don't have a familiar ethnic cuisine; your diaspora , from what I understand, is mostly in Southern California, three time zones removed from the national media in New York; and you don't have a recognizable, long-simmering conflict like the one between the Israelis and the Palestinians, where people in the richer nations can take sides and argue over at the dinner table. The best you can do is get the United Nations involved, as in East Timor. Maybe they'll send troops. ""We don't want the United Nations" Mr. Nanabragov said. "We don't want Sri Lankan troops patrolling our streets. We're better tan that. We want America." 14. "I would rather see the United States respected than loved by other nations." 15. "May the United Nations ever be vigilant and potent to defeat the swallowing up of any nation, at any time, by any means-by armies with banners, by force or by fraud, by tricks or by midnight treachery." 16. "Whenever I speak at the United Nations, UNICEF or elsewhere to raise awareness of the continual and rampant recruitment of children in wars around the world, I come to realize that I still do not fully understand how I could have possibly survived the civil war in my country, Sierra Leone." 17. "On the American Oligarchy"How about the United States?" a man yelled from the audience. "And what about it?" Martin retorted. "The thirteen colonies threw off their rulers and formed the Republic so-called. The slaves were their own masters. There were no more masters of the sword. But you couldn't get along without masters of some sort, and there arose a new set of masters–not the great, virile noble men, but the shrewd and spidery traders and money-lenders. And they enslaved you all over again–but not frankly, as the true, noble men would do with weight of their own right arms, but secretly, by spidery machinations and by wheedling and cajoling and lies. They have purchased your slave judges, they have debauched your slave legislatures, and they have forced to worse horrors than chattel slavery your slave boys and girls. Two million of your children are toiling today in this trade-oligarchy of the United States. Ten millions of your slaves are not properly sheltered nor properly fed." 18. "Governments of rich countries spend some $6bn of tax money a year on disaster relief and development aid overseas, while each new earthquake, famine or tidal wave can attract 1,000 aid organisations, from the United Nations Children's Fund and Oxfam to the 'Jesus Brigades' of the American south and other charitable adventurers." 19. "We have helped to organize the United Nations. 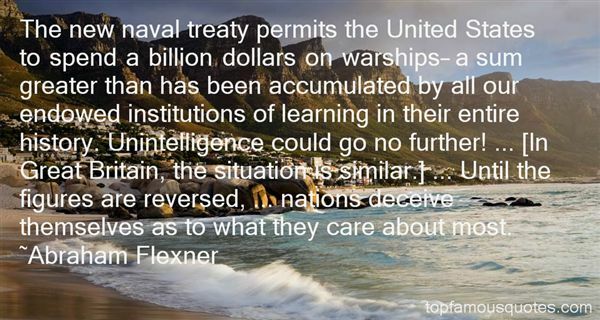 We believe it will stop aggressor nations from starting wars. Because we believe it, we intend to support the United Nations organization with all the power and resources we possess." 20. "Ten years ago in Nairobi we said that the participation of women in the decision-making and appraisal processes of the United Nations was essential if the organization was to effectively serve women's interests." 21. "On many occasions New Zealand has spoken about the need to ensure that women's concerns are fully integrated into all aspects of the United Nations' activities and structures, not marginalised in one part of the Secretariat." 22. "Further, not only the United States, but the French, British, Germans and the United Nations all thought Hussein possessed weapons of mass destruction before the United States intervened." 23. "Yes, I got my first Bolex camera a few weeks after being dropped in New York by the United Nations Refugee Organization. That was on October 29th, 1949. With my brother Adolfas, we wanted to make a film about displaced persons, how one feels being uprooted from one's home." 24. "The diplomatic representatives of the United States of America to other nations are almost entirely Jews." 25. "John Danforth, I thought, was a great senator and did a great job with the United Nations. I think he's a good man." 26. "Their [realists'] concern is that utopian aspirations towards a new peaceful world order will simply absolutize con?icts and make them more intractable. National interests are in some degree negotiable; rights, in principle, are not. International organizations such as the United Nations have not been conspicuously successful in bringing peace, and it is likely that the states of the world would become extremely nervous of any move to give the UN the overwhelming power needed to do this." 27. "If Australia wants an effective United Nations, we have to be comprehensively, not marginally, engaged." 28. "The blood and sweat shed by United States and United Nations troops proved to be the prime mover behind the realisation of freedom throughout the post-war period." 29. "In the 21st century, I believe the mission of the United Nations will be defined by a new, more profound awareness of the sanctity and dignity of every human life, regardless of race or religion." 30. "As an old, old man, Trout would be asked by Dr. Thor Lembrig, the Secretary-General of the United Nations, if he feared the future. He would give this reply: 'Mr. Secretary-General, it is the past which scares the bejesus out of me." 31. "I hope I'm remembered as the king of the world, the noble man who united all the nations of the earth. But that probably won't happen." 32. "The WHO is the lead agency in health in the United Nations system, and clearly we have very important functions to play." 33. "There was a lot of protest after Bravo, from countries like India, for example. India was the first country which came forward and proposed at the United Nations that all of these nuclear tests should be stopped, that there should be a complete ban on nuclear testing." 34. "Mr. Speaker, in seeking to return to the United Nations, the Republic of China on Taiwan will once again ask diplomatic allies to present its case before the United Nations this fall." 35. "All countries, big or small, strong or weak, are equal members of the United Nations." 36. "What I want to make clear though is that we oppose terrorism in any form. However, any operation against terrorism should be under the framework of the United Nations and follow the fundamental principles of international laws." 37. "But it is important to observe that when Europe or the United Nations impose sanctions that are supposed to be aimed against a certain regime, usually generally millions of people end up being directly punished." 38. "Like Canada, we very much wanted the United Nations to be a relevant and effective body. But once those efforts failed, we no longer saw things from a multilateral perspective. For us, now, it is much more basic than that. It is about family." 39. "It's only when we understand [Jesus'] presence in the church as being the fulfillment of God's promise in Zephaniah 3:17 to "quiet you with his love" and "rejoice over you with singing" that a crucial aspect of our salvation comes into perspective. Jesus didn't coldly settle accounts for us. He doesn't bark us into improving ourselves. He united us to himself in the glorious communion he has enjoyed for eternity with his heavenly Father. He resides within us to heal the broken places and refresh cauterized hearts. He sings us into a new mode of existence.... When, as Paul does, we imagine Jesus singing nations into submission to his rule, our hearts come joyfully under the sway of a love that is infinite and powerful." 40. "United Nations peacekeepers are going all over the world spreading AIDS even while they're trying to bring peace. What a supreme irony." 41. "We spent a month in Japan last year, a week in Istanbul for the United Nations, and nearly three months in my native Nova Scotia, where my two brothers have homes; and we'll go back there this summer." 42. "I cheated at the Model United Nations when I was 13 and had to get up and apologise in front of the whole conference." 43. "The last line of Hawaii's Story by Hawaii's Queen is addressed to the American people and their congressmen. "As they deal with me and my people, kindly, generously, and justly, so may the Great Ruler of all nations deal with the grand and glorious nation of the United States of America." It's clever to imply that if the U.S. swallows up her little country, God will smite it. As I reread the last sentance of a book written by a Hawaiian queen wh was taught to read and write by American missionaries, her final thought seems emblematic of how hierarchical Hawaiians adapted to Christianity. Jehovah, "the Great Ruler of all nations," is the highest high chief in the universe." 44. "The U.N. acts as the world's conscience, and over eighty-five percent of the work that is done by the United Nations is in the social, economic, educational and cultural fields." 45. "India has indeed a great and free future before her, in which she can make her special contribution to the well-being of mankind. The first and indispensable part of that contribution is to work with the United Nations for the defeat of fascism and of brutal aggression." 46. "I spend every day up at the United Nations where I have to interact with 192 other countries. I know how well the United States is viewed." 48. "Marxist Man could not have come upon the earth at a more illogical time. In an age when technological advances have finally made it feasible to adequately feed, clothe and house the entire human race, Marxist Man stands as a military threat to this peaceful achievement. His sense of insecurity drives him to demand exclusive control of human affairs in a day when nearly all other peoples would like to create a genuine United nations dedicated to world peace and world-wide prosperity. Although man can travel faster than sound and potentially provide frequent, intimate contacts between all cultures and all peoples, Marxist Man insists on creating iron barriers behind which he can secretly work." 49. "It had an enormous impact to the point of the United Nations passing a resolution against the killing and hunting of these whales as they are an endangered species. This was a documentary on the plight of the whales." 50. "Now, the United Nations is an organization that I believe was founded with good intentions. As a matter of fact, a prominent Tennessean named Cordell Hull was very involved with it." I'm chasing you. I'm going to chase you until you give this a chance."